Atinsky and the other co-owners, husband and wife Allen and Kari Church, have been working with Flux Design Ltd.; Jacob Morrison, an architect from Madison; and Second Chance Wood Works & Contracting to give a major facelift to the old Albanese’s building, and the results are night and day. Way before Albanese’s, the building housed two businesses at one time. According to Atinsky, the Keefe Avenue side was a 27-foot-wide butcher shop, and the Pierce Street side was a storefront. “We discovered maple floors under seven layers of tile,” said Atinsky, which was probably a blessing, because the wood flooring has been nicely preserved. Also discovered was an ornate tin ceiling from the 20s, he added. But the renovation process isn’t just about bringing the past back to life, it’s also about incorporating the new. “Art is a very important part of what we’ve been doing,” Atinsky said. “I commissioned three new art pieces and bought six more from the same artist.” He’s referring to David Najib Kasir, a half-Syrian, half-Iraqi artist from Chicago, who went to the Milwaukee Institute of Art & Design. “All the art pieces make you look at them and think about them,” Atinsky said. And while you’re doing that, you’ll also want to be thinking about what to drink, because there is a lot to choose from. Thirty beers on tap, two wines on tap (plus eight bottles to choose from), a large selection of whiskies, several rums, tequilas, and so on, though with a main focus on the whiskies. There’s also an emphasis on beer, and if you’re a craft beer connoisseur, the Riverwest Filling Station also offers growlers. To those not familiar with what a growler is, it’s a 64-ounce bottle that you can have filled with beer and then take home with you. Sounds simple enough, but it took some effort and the help of Alderman Nic Kovak to make this happen. It turns out that there was an old ordinance against this sort of practice, unless you were operating a brewpub (a pub or restaurant that brews beer on site). So Atinsky took the matter to Kovak, who then spent one-and-a-half months with it while it went through the legislative process, and ultimately came to a happy conclusion. 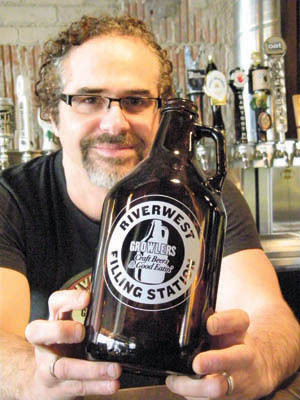 “The Riverwest Filling Station got growlers legalized,” Atinsky was pleased to say. He means it, too. How many places can say they have their own house bacon? “We have a smoker here,” Atinsky said. “We brine the pork for seven days and then smoke it with apple-cherry.” They also do pork ribs and lox, he added. The lox is brined in salt and dill and then cold smoked. Atinsky lived in Israel for a number of years, so there will also be some Middle Eastern selections. Such savory things as homemade baba gannoujh, hummus, and a Yemenite hot sauce you’ll find on your table called schoug (ask your server how to pronounce it). Yet that’s not all. The cooks also offer southern-fried chicken with gravy and buttered grits. Or an open-faced blackened-catfish sandwich. Or periodic specials. With all that eating and drinking, you’re bound to have to use the restroom sooner or later, and even that should prove to be an interesting experience. For the men, you’ll discover what happened to that old Albanese’s lighted sign that used to hang out front. And for the women, the owners have an artist working on a piece that will look like a flowing river. Once the weather warms up and the nearby Milwaukee River has, itself, begun flowing again as the ice melts, look for outdoor seating along the Pierce Street side of the building. The windows along that side also open up, said Atinsky. The owners got an entertainment license, and would like to feature some background music like a blues guitarist, or some soft jazz to be playing while people eat. Nothing too loud, though. “We do want it to be a place of meeting and conversation,” Atinsky stresses. He’s not a fan of places where the music is so loud that you can’t hear the person next to you when you’re trying to talk. If this takes place, or even if it doesn’t, feel free to bring your laptop – there will be free Wi-Fi. And something else the owners will feature is not only a power outlet at your table to plug in your gear but also a USB port. “I hate it when you’re out somewhere and your phone dies,” Atinsky said with a laugh. By now, it should seem apparent that there’s a lot of thought that went into the planning of the Riverwest Filling Station. From the renovation of the building, to the artwork, to the menu, and even to the bathrooms – so who are the people who came up with all these ideas? As mentioned earlier, Atinsky has extensive professional cooking experience, yet he also was in journalism for about 16 years. Kari Church has a lot of the front-end experience working in the service industry, such as bartending and waitressing, not to mention having earned a master’s degree in education. And her husband, Allen, was the head lab technician at Harvard before moving back to Milwaukee to be closer to family. Riverwest Filling Station -701 E. Keefe Ave.